Unbeknownst to many, the 2015 NHL All-Star game will mark the 60th game played. 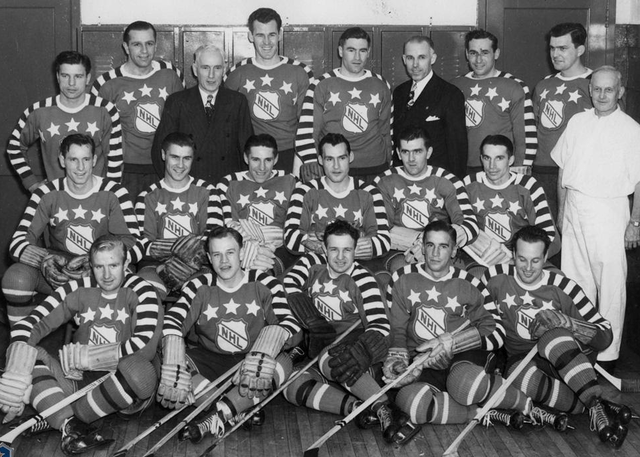 The first NHL All-Star game occurred on October 13, 1947 pitting the defending Stanley Cup Champion, Toronto Maple Leafs, against the NHL All-Stars. The game ended with the Maple Leafs pulling it out 4-3. The original intention of the game, was a means of hosting a benefit for families of former NHL players. The players chosen were unlucky enough to have had accidents on or off the ice, that left them injured or deceased. There were only three such games in all, prior to the first officially considered All-Star game of 1947. The players honored in each individual game were Irvin Bailey (1934), Howie Morenz (1937), and Albert Charles Siebert (1939). The game’s proceeds to this day still benefit the pension fund for players. Since the game was first introduced, there have been many changes throughout the years, with both the game itself, and the sentiment that resonates with it. In 1967, the placement of the game was changed. The NHL decided it best to move the game from prior to the start of the NHL season, to around the mid-season mark. The NHL made the decision in great part, so that it would no longer have to compete with playoff baseball, nor the start of the NFL season. As the game continued to grow and change through the years, so did the two teams playing. As mentioned above, the game was played, matching up the previous year’s Stanley Cup Champions against the NHL All-Star team. 1969 marked the first change, with an East/West Division matchup. In 1974, the names of the two teams were transformed into the Wales/Campbell Conference matchup. 1998 saw the whole scheme change. For the first time ever, the game was now international, with the North American All-Stars facing the World All-Stars. This lasted until 2003, when it once again reverted back to interleague play, between the East and West Conferences. Currently, the NHL All-Star team’s are named after the respective Captain for each team. With such a storied history full of transition; much of the present upcoming game is confounded with controversy over quite a few aspects. While there has been a lot of positive publicity; there is also a bit of dissention within the fan base. Most notably, the look and presentation of the uniforms being presented on the ice for this years’ game. 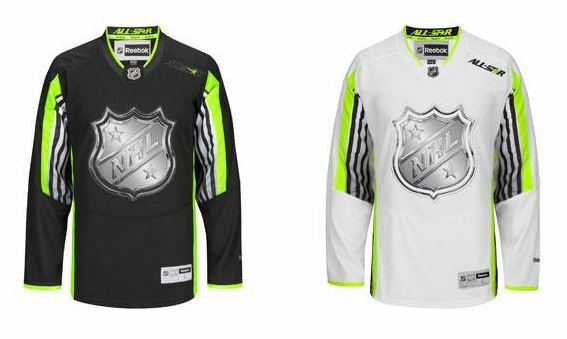 Many contend that though the uniforms are a fit for the X Games, they’re also uniforms, that should never be worn on NHL ice. Aside from the glaring neon green and black jerseys, there is even more dissatisfaction amongst fans, with some of the players picked. That, as well as those left off of the list altogether. The selection of the NHL All-Star’s, is currently broken down by the following rules. The first 6 players are picked directly by fan votes. The rest of the teams 36 All-Stars and 6 rookies are selected by the NHL respectively; mandating that there must be at least one representative from each of the 30 NHL teams, currently in the league. Each of the two teams’ Captains, Nick Foligno and Jonathan Toews, conduct the NHL All-Star fantasy draft, as they already have completed. Though the NHL has continued to rework the selection process, many fans are still left feeling unnerved by the way in which it is conducted. One of the biggest complaints, is that five of the six fan vote selections are all Chicago Blackhawks. Fans would like to see this changed to an overall, better rounded selection of players from other teams around the NHL. Others counter; stating that if fans wish to see others selected, then they should get to clicking that vote button prior to the end of the voting process. According to an NBC sports fan poll, the top five snubs for the All-Star game include Henrik Lundqvist (19.05%), Nicklas Backstrom (9.28%), Pavel Datsyuk (9.11%), P.K. Subban (7.65%), and Joe Pavelski (4.78%). The greatest question leading up to the All-Star game, seems to be that if this game is for the fans (as is promoted), then why are so many of the players picked by the NHL? Is the reason because the NHL refuses to listen to the fans, or does the controversy lie within those disgruntled, because they do not get to see their own favorite player on the ice? Others prefer their teams’ players not play in the game at all; understanding that it is simply an exhibition game that may leave players injured, and unable to work toward solidifying a playoff spot. Regardless of everything, both positive and negative, it might be better for the league to look into condensing the game into an outdoor, Winter Classic All-Star game. This would not only achieve a new outlook on the game. It would also reinvigorate a bored fan base, instead of leaving fans further bored with the overall monotony of what the game has become. It might also once again, instill a sense of pride for those player’s honored, with the designation of being chosen as an NHL All-Star. Next Story → Columbus did an All-Star performance.